Against a backdrop of heightened tensions in the region and other worrisome developments, Wixarika leaders have filed an injunction to stop the illegal drilling in exploration for gold and silver in their ancestral sacred lands of Wirikuta. Since March 1 of this year, the Wixarika Regional Council for the Defense of Wirikuta has been petitioning the Mexican government to intervene to stop the current exploration that is occurring in the region without the required permits, but they have received no response to date, prompting them to file the injunction in a federal court. 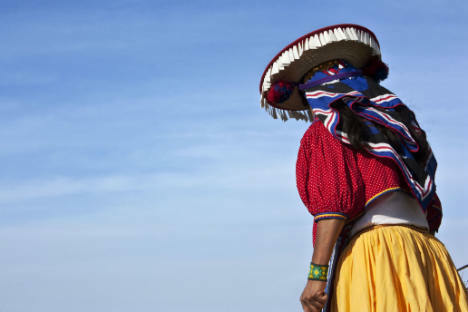 The drilling and excavation is occurring on a wide and destructive scale, the Council said, in the sacred desert where the Wixarika or Huichol people have conducted their pilgrimages since the beginning of their history. Also last week, Wixarika leaders decried the appointment of Hector Moreno, current mayor of the town of Real de Catorce, as president of the Board of Directors of the Wirikuta Ecological Reserve. The appointment represents “an aggression against our people and the people of the region, given the scientific evidence, which makes any new mining projects prohibitive due to the extreme overexploitation of aquifers,” the Wixarika Regional Council wrote in a June 25 bulletin. Moreno’s financial ties to First Majestic Silver present a serious conflict of interest for a body whose aim is to protect the ecology of the region, they argued. They further accused Moreno of generating animosity against the Wixarika people, promoting rumors that the indigenous group is aspiring to gain financially by taking over the livestock and lands of the local inhabitants, an assertion they claim is entirely false and is generating a dangerous atmosphere of hostility and harassment against the Huichol people. Additionally, some Wixarika visiting the region have been threatened that they will be denied access to the lands where they have traveled to pray, leave offerings, and ceremonially hunt their sacred peyote, or hikuri, since time immemorial. These pilgrimages to Wirikuta and the use of their sacred cactus are essential to their continued cultural survival – and indeed, to the continued equilibrium of the forces of nature on the planet, according to their beliefs. via Injunction filed to halt illegal exploration drilling in Wirikuta.